I don't know if this little falls has a name or not, so I gave 'em a name. The falls are not the real attraction anyway. The attraction is the pleasant and fairly easy 2.5-mile hike along the East Fork or Fish Hatchery Trail from the Walhalla Fish Hatchery to the Chattooga River. 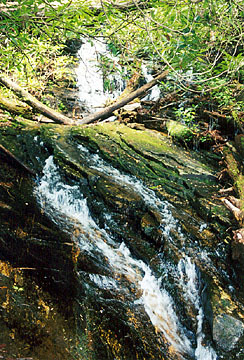 The falls are at the one-mile mark along the trail. 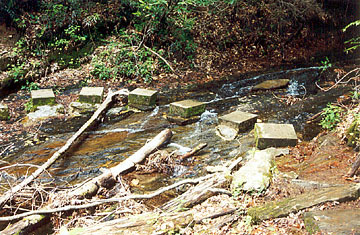 Look for the stepping stones mounted on cement in the creek and look upstream to see the 10-foot falls. 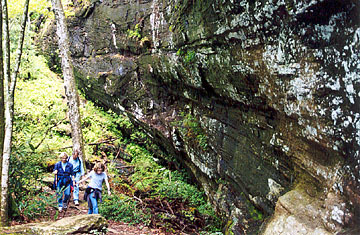 The trail follows the East Fork of the Chattooga River to where it joins the main branch of the Chattooga River. 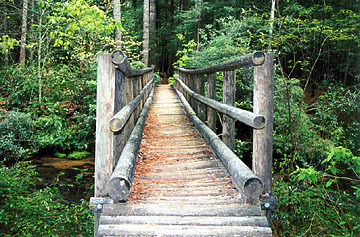 The East Fork trail ends at the "Fourty Thousand Dollar Bridge" over the East Fork where it intersects the Chattooga Trail. About 2 miles upstream of this intersection on the Chattooga Trail are Ellicott Rock and Commissioners Rock where two 19th-century surveys found SC, NC and GA to meet. (Considering the technology that the surveyers were using at the time, they were only a few yards off the actual meeting spot.) 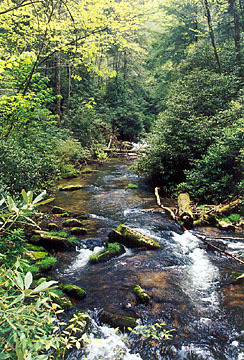 About 3 miles downstream on the Chattooga Trail is Burrells Ford Road and Burrells Ford Campground. Directions: From Walhalla, SC, drive SC 28 north to its intersection with SC 107. Turn right onto SC 107 toward Oconee State Park. Follow SC 107 north for 12 miles past the state park, Cherry Hill Campground and Burrells Ford Road. Turn left at the sign directing you to the Walhalla Fish Hatchery. Follow the road down to the hatchery and park in the designated parking area. At the bathrooms, follow the wooden walkway a few feet and look for a hiking trail sign to the left. Pass a wood and stone picnic shelter and then turn left onto the trail. Trail markers are few and far between, but the trail is easy to follow. Be sure to visit the Fish Hatchery to learn how trout are raised.